Despite some conflicting contrasts between an Aries and a Sagittarius, the relationship is bound to be a stable and productive one. The relationship between these two fire signs will be a mix of thrill, excitement, passion, and adventure. This couple is perfectly matches with a lot of playfulness and the ability for the two to compliment one another very well. Due to the fact that both signs are full of youth and vitality, high energy levels are prominent between this pairing. Despite being perfectly matched and having a lot in common, these two will need their own time to grow and need their own freedoms. On the positive side, neither of these two are going to even attempt to control the other one unless the issues are their own personal ones. Aries never ending impatience rears its head in this matching as well. 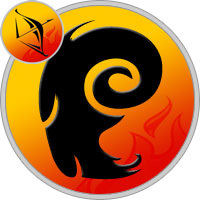 For an Aries may become impatient because of the Sagittarius unemotional nature. Aries and Sagittarius is a great match, and you have much in common. You’re both highly adventurous and curious, active, spontaneous, outgoing and fun loving. Not many other signs can keep up with either of you, but in each other you’ve not only found someone who can, but who will enjoy the challenge of doing so. The first dinner date with Sagittarius should be at the most exotic place you can find. As risk takers, both Aries and Sagittarius love strange and sensual places. Good topics for conversation are travel and vacations. If dinner isn’t on, then sporting events are the answer. Aries and Sagittarius love high energy everything so go to a basketball game or play tennis. The male Sagittarius loves the thrill of the chase. While Aries is trying to catch him, he may be off chasing other women. But, Sagittarius is the number one victor of one-night stands. The Sagittarius horoscope would advise, “Your Aries is real and precious, stop chasing the illusive.” Both of these zodiac signs must learn forgiveness and patience. Astrologically, this couple is able to get along so well as friends and lovers that a long-term love relationship can be strong. Aries and Sagittarius will have arguments. If they get through them unscathed, boredom will be the next enemy of the long-term relationship. These two zodiacs chase boredom away with an equal quest for adventure or call it off. Sagittarius values freedom more than Aries. Aries can be successful by giving Sagittarius the needed freedom and by taking the relationship slowly. Perfect for physical Aries, Sagittarius likes to explore sexually. This couple will have love in the bedroom and are likely just about anywhere else as well. They will engage in risque encounters, and love every minute. The Sagittarius’ thighs are their erogenous zone and Aries is the head. These two zodiac lovers will use passionate to keep going back to each other. Neither Aries nor Sagittarius is above using flattery. If this couple ever gets to the altar, the marriage will be successful. Sagittarius can be flexible and doesn’t mind if Aries takes charge and becomes the leader. Both avoid clingy relationships and are tough skinned. Once committed, they are loyal to each other. With Aries’ enthusiasm and Sagittarius’ audacious nature, this couple can be in a love relationship for life.